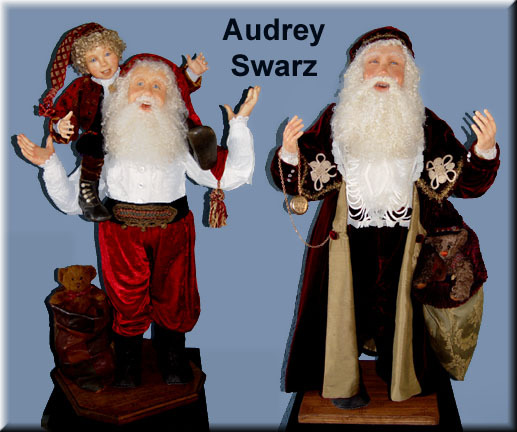 Audrey Swarz is not only an extremely talented doll artist (just look at some of her pieces below), but is also an exceptional mentor/teacher. Her online sculpting classes have launched many careers (as well as many wanna-be careers, like mine). 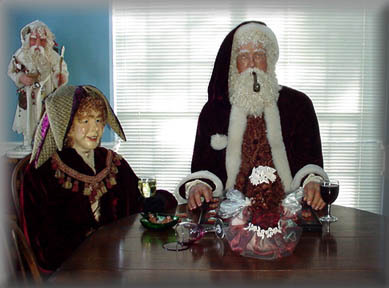 To learn more about her sculpting classes, check out Audrey's Sculpting with Clay page. This illuminated shadow box was created in 2003. The elf (the time-keeper) is wearing a working watch, since he needs to let Santa know how much time they have before they are on their way! 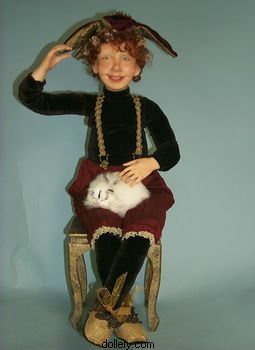 This box includes a Steiff antique lamb from the early 1900's! 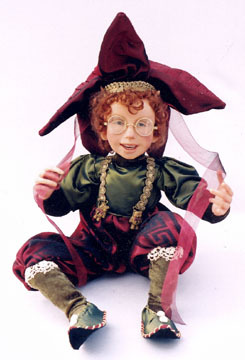 The elf's shirt and hat were hand-painted. Measurements are: 22" wide, 26" tall, 8 1/2" deep. 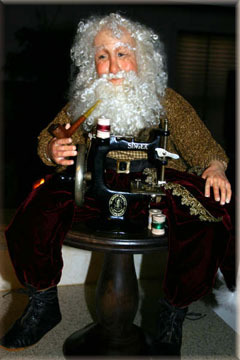 Santa sits atop a wood pedestal (or whever he wants - he isn't attached), sewing a new hat on his antique Singer sewing machine! He has blue glass (Masterpiece) eyes and angora mohair bearding. 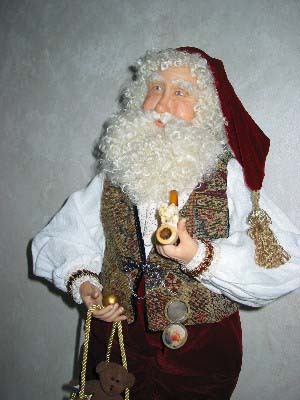 Santa holds an antique pipe and wears antique black leather boots. Audrey's mom (Mary) hand-knit the gold sweater with silk yarn. 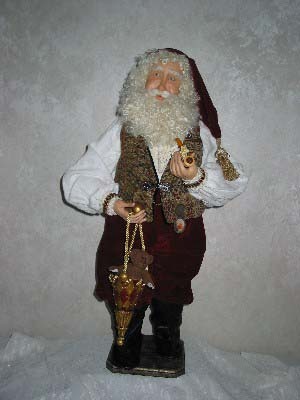 Santa wears burgundy silk velvet pants and a flannel shirt, and a black leather belt with a gold buckle. Willie was purchased from Fantastic Fantasies. 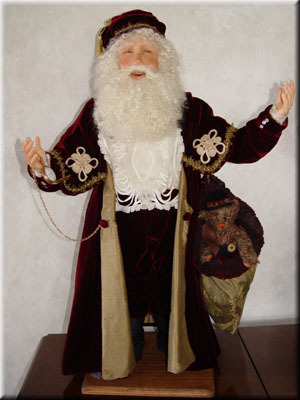 He sits about 12" tall (not counting for his pointed hat), and would be about 25" tall if he was standing up. 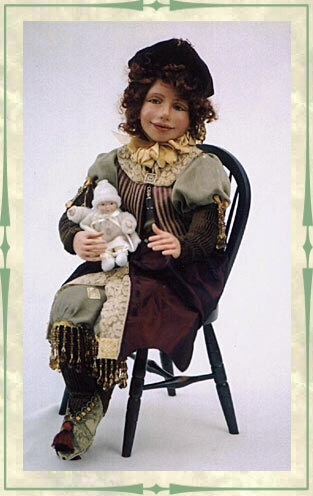 He is a free-sitting (no base) doll with a delightful expression. I had tried to purchase Willie when he was first created, but somebody else beat me to him. Fortunately for me, the purchaser had to later sell a lot of her pieces, so I got a shot at him (which I grabbed immediately)! Willie sits in my study to inspire/cheer me daily! 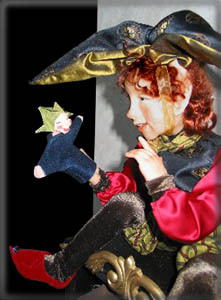 Puppet Theater was purchased from Fantastic Fantasies. 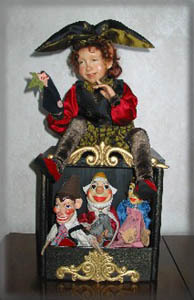 Three antique puppets are displayed in an adorable puppet theater, while a little elf sits atop playing with a hand puppet. I purchased a wonderful black stand that seems perfect for this piece (center photo above). The trio enjoys a little wine and a game of Checkers. 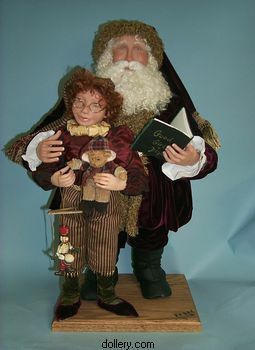 Santa (nicknamed "Fanta Santa", due to being purchased from Fantastic Fantasies), is a 29-inch cernit creation with rich deep burgundy velvet suit and hat, cream linen lace shirt, suede boots, angora mohair wig and beard, and blue glass eyes. 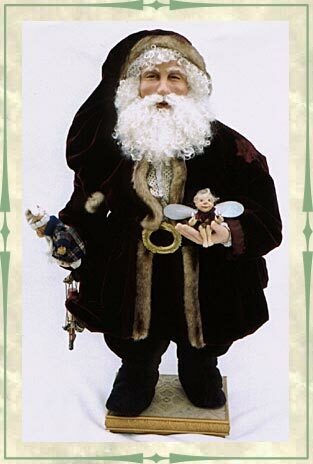 He holds a winged elf/fairy in one hand, a little bear and marionette in the other. 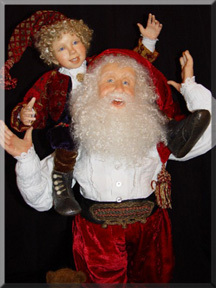 Santa has hand-made leather boots. 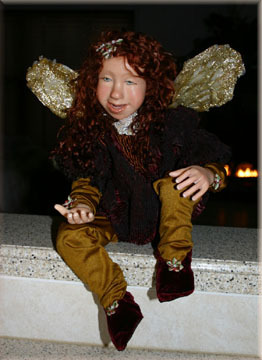 Ian was purchased from The Dollery at Merry Christmas Shoppe... Elf Girl was purchased from Fantastic Fantasies. 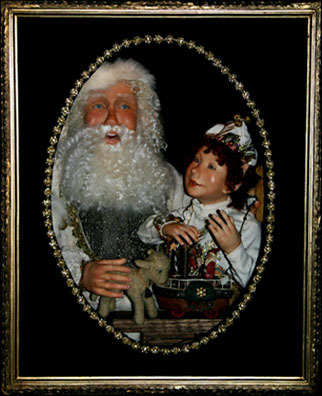 "Santa with Elf" was purchased from The Dollery at Merry Christmas Shoppe. Purchased from The Dollery at Merry Christmas Shoppe.